How did your gardens hold up to this week’s crazy winds? It was a nail biter! We normally see a lot of wind this time of year but we set some records on Thursday. Luckily, there’s still time to plant if anything was damaged. Becoming a Desert Gardener is a wonderful resource for what to plant when that is based on our climate in Las Vegas. Asparagus, celery, bulb onions and radishes are considered cool season crops for our area but there’s still time to plant them in early April. This is the prime planting season for warm season crops. For our area, this includes beans, melons, eggplant, peppers, tomatoes, okra and sweet potatoes. Squash can also be planted now but you’ll great reduce squash bug problems by waiting until Father’s Day. Speaking of bugs…they are loving our warmer weather! It’s really important to be on the lookout for them and address them quickly before they get out of hand. This is especially important in a community garden where they can spread quickly. There are many ways to address bugs using organic practices. I’ve seen tons of ladybugs in my garden bed and elsewhere at the community garden. They really help with aphids. Check out these publications for the University of Cooperative Extension for more information. Don’t panic is you see a lot of these little bugs around the garden. 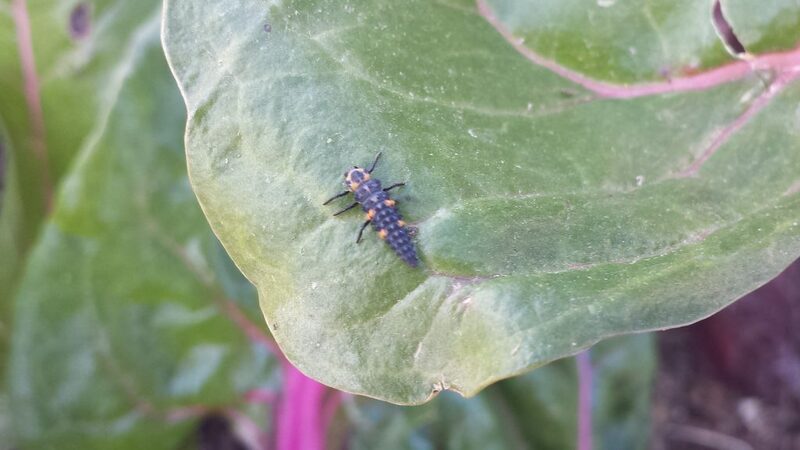 They are ladybug larva. These are good guys you’ll want to keep around. They actually consume more aphids than the adults. You can contact the Master Gardeners at 702-257-5555 Monday – Friday from 9am-3pm with any gardening questions.